Ermonela Jaho is the most favorite soprano and she is considered a flying star for the world famous operas. Wherever she has performed, she has shined. This undisputed success makes every Albanian proud. But recently it is a documentary film that will be shot by the Royal Opera House in London in the name of the world famous Albanian soprano Ermonela Jaho. This statement was made on the official website of the opera, where this institution appreciates the soprano with unusual metaphor, implying that Ermonela is the voice of Opera.
" 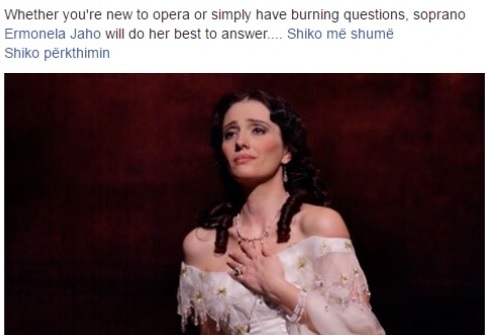 Wether you are new to Opera or have burning questions, Soprano Ermonela Jaho will do her best to answer.... We will select some songs and we will use to create a film that will be shot next week." Reads the official website.